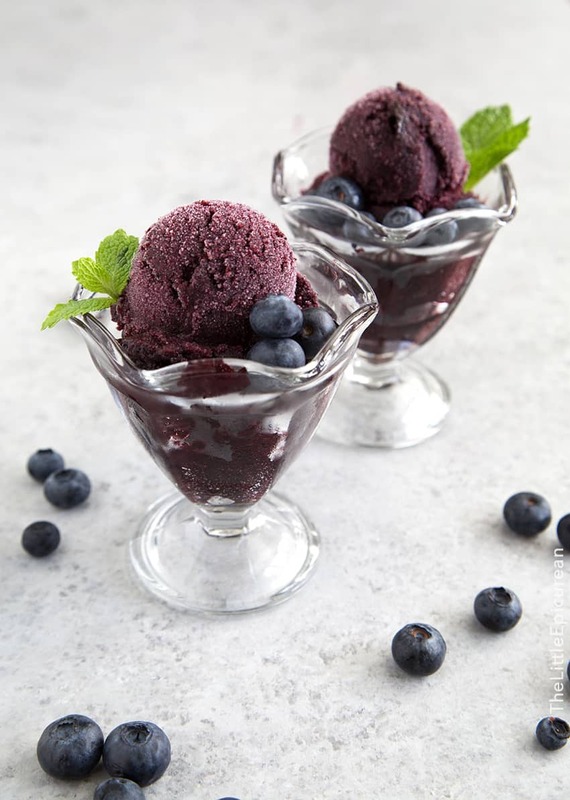 This 4 ingredient blueberry sorbet highlights summer’s bounty by using fresh blueberries. I pride myself on my ability to wear white without splattering any food on myself. Give me spicy miso ramen, a giant bowl of spaghetti and meatballs, or ask me to open a pomegranate, and I’ll finish the task without a splash on my shirt. I thought I had clean eating skills until this blueberry sorbet gave me a challenge. Made with fresh blueberries (raw, no cooking down the berries! 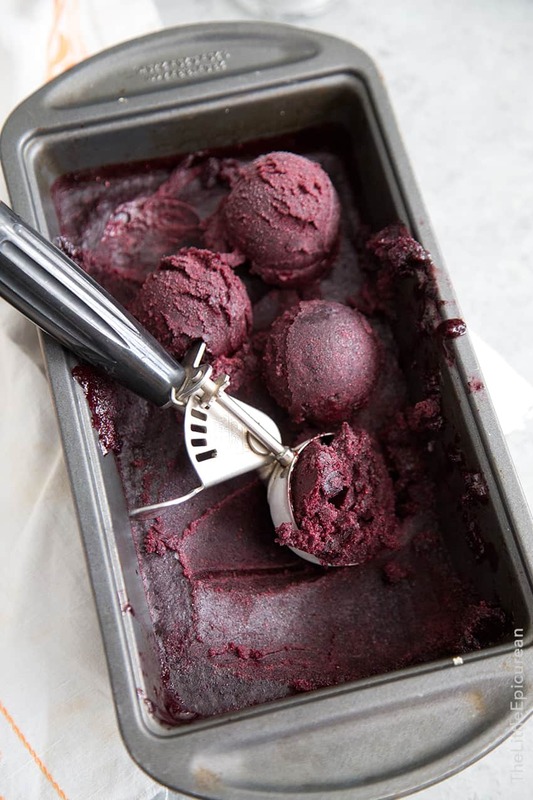 ), this sorbet takes like biting into a dozen blueberries all at once. It was so good that I lost composure for a moment. Before I knew it, a little bit of the sorbet slid off my spoon and dribbled onto my shirt. FAIL. Blueberry stains are some of the worse. Luckily, I wasn’t too angry or disappointed. This blueberry sorbet is worth the mess and laundry. I’ve always thought of sorbet as ice cream’s much healthier cousin. No milk, cream, or eggs in this dessert. It’s made with 4 ingredients: fresh blueberries, lemon juice, sugar, and corn syrup. Is corn syrup necessary for this sorbet recipe? I know what you’re thinking: corn syrup, yuck! Corn syrup is different from high fructose corn syrup. 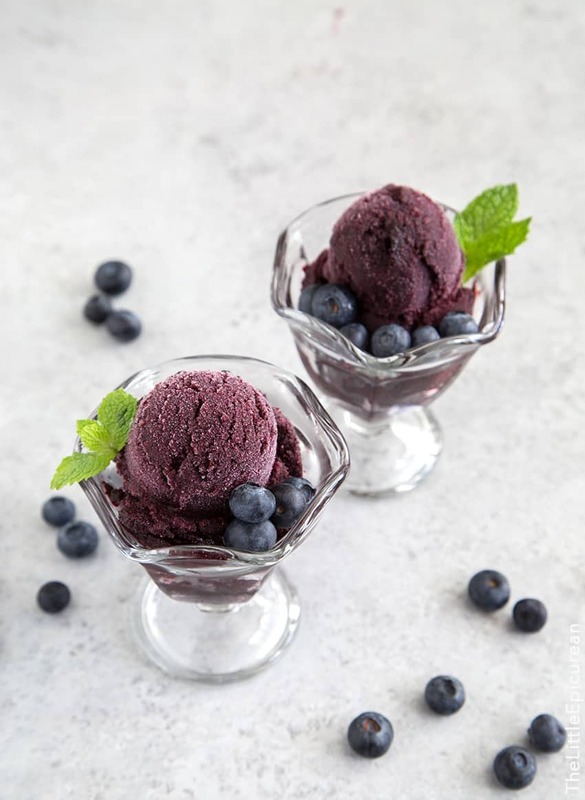 For this recipe, we’re using a little bit of light corn syrup to prevent unwanted crystallization in the blueberry sorbet. As an invert sugar, light corn syrup helps to keep the sorbet creamy instead of icy when frozen. Alternatively, you can substitute vodka. And if you’re super concerned about it, you can go ahead and omit it all together. I love the rich flavors and super dramatic colors of this sorbet. Summer may be coming to end, but while the sun’s still out and the berries are still bountiful, I’m going to continue enjoying summer’s bounty. I’ll just remember to wear dark colored shirts next time I eat this. Interested in summer cocktail floats? We’ve got: blueberry mojito floats, cucumber gin and tonic floats, greyhound cocktail floats, watermelon margarita floats! Rinse blueberries and pat dry or toss in colander to remove excess water. Put berries in a bowl of a food processor or blender. Add lemon juice, sugar, and light corn syrup*. Process until mixture is a smooth puree. Transfer to an airtight container and let chill in the fridge until cold (1-24 hours). Freeze mixture in ice cream maker according to your unit's instructions. Once sorbet has reached a soft serve consistency, transfer to a freezer safe container. Freeze for at least 2 hours before serving. Allow to sit at room temperature for 5 minutes before scooping and serving. Garnish with fresh mint and additional blueberries. Light corn syrup is an invert sugar that helps prevent crystallization. This helps the sorbet remain creamy instead of icy when frozen. You can substitute vodka, if desired. You can also omit this ingredient. However, your sorbet may freeze icier than expected. I use this compressor ice cream maker. This machine uses a commercial-style compressor so you don't have to pre-freeze your ice cream bowl ahead of time. I love the color of this sorbet, so fresh and delicious! And I wish I had even a fraction of your talent for wearing white and keeping clean! This is super gorgeous, and yes, I’d say definitely worth a little extra laundry time. I am totally the opposite! I won’t spill anything on myself unless I’m wearing white. 😂 Coffee, tomato sauce, chocolate–if I’m in white, you name it, and I’ll be wearing it. This sorbet looks amazing! I wouldn’t be mad either if I spilled this on myself! I wish I had your skills. I am lucky if I can wear anything for an hour and not managed to get it dirty somehow. 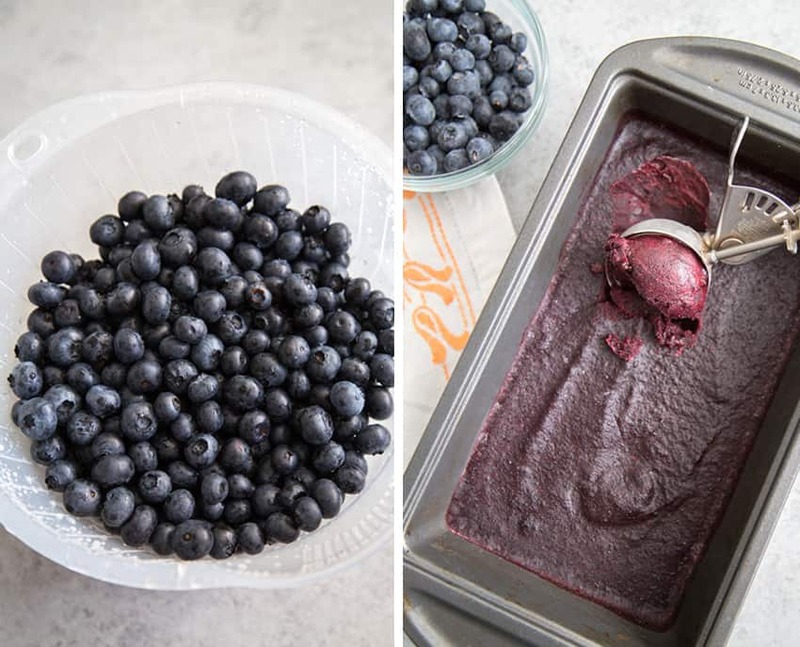 This blueberry sorbet is totally worth getting messy for. I can’t get over the deep color. It’s beautiful! Just gorgeous! What a wonderful way to use up my blueberry stash. 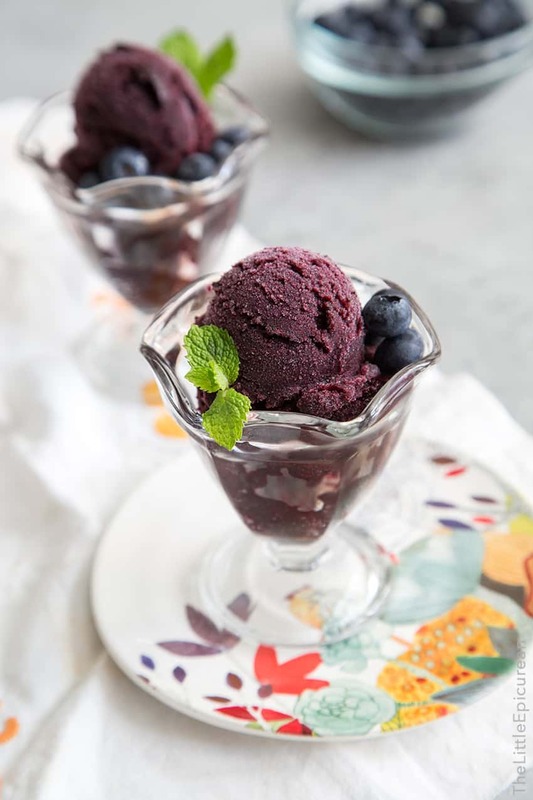 I love the color of this sorbet…blueberries are my kids’ favorite summer fruit.